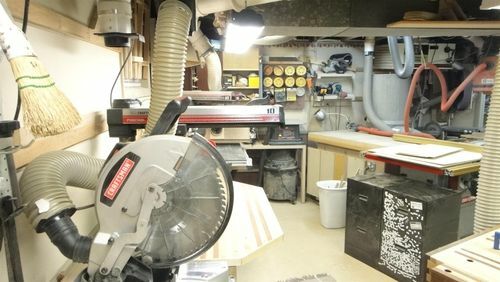 Everyone loves shop photos, so here goes…..I just got into woodworking 1-1/2 years ago and have added onto the shop twice since then. 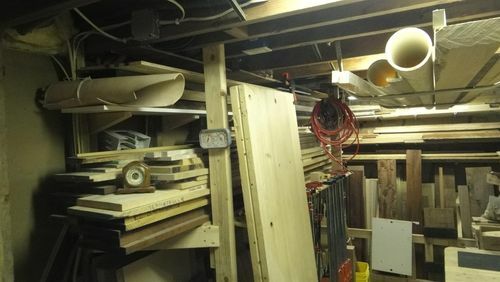 The original shop was where the wood room is now (first photo) then I doubled in size (in the area of the second photo) and finally kicked the furniture out of the family room and got some elbow room (last four photos). So it is an L shaped space. 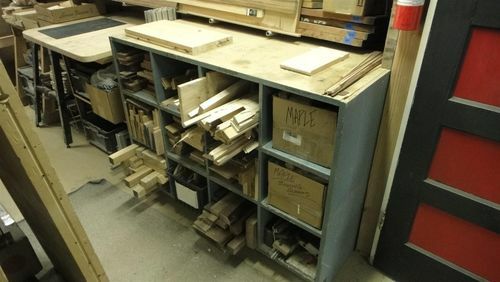 I find great deals on short lots of hardwood flooing on CL so use it alot for shop projects like the wall cleats on 3 walls, the downdraft/outfeed table, etc. 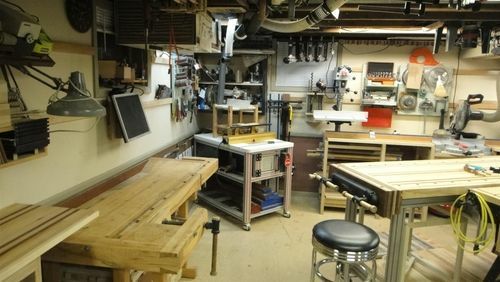 The assembly table in the middle is an old (high end) drafting table with power lift and it is flat and pretty sturdy. I have a few chucks of maple bowling lane in the garage and am in the process of building a real bench. 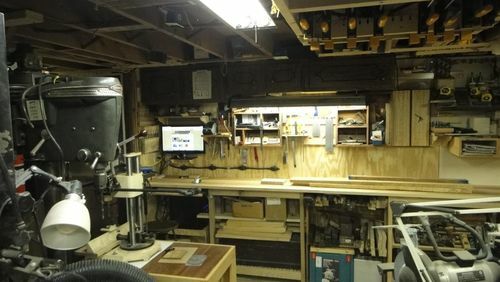 Hard to see in the pictures, but have all the sanding stuff in one corner, one is a modified Performax drum that bolt on the radial arm saw, I added a precision sliding table and it works good. 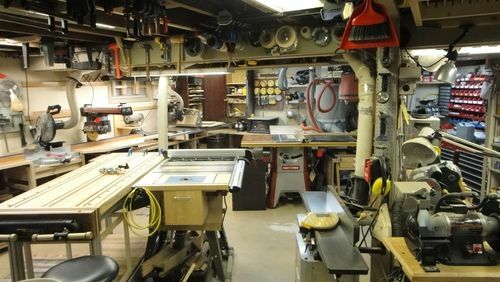 Also a 6×48 belt sander and spindel sander back there. Don’t have the floor space for all of them, so have to juggle around a bit to use them. 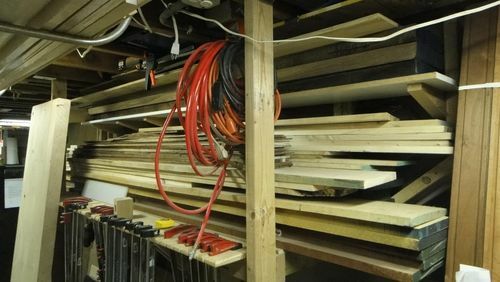 All clamps are stored up in the floor joists along with a bunch of other stuff. No storage space is overlooked! 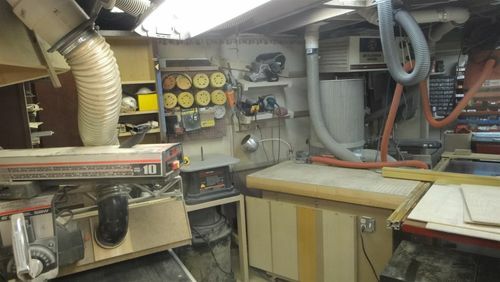 I posted the lathe project a few weeks ago, and I have since modified the grinder next to it with a new Norton blue wheel and Veritas sharpening jig. Sharp tools are amazing! 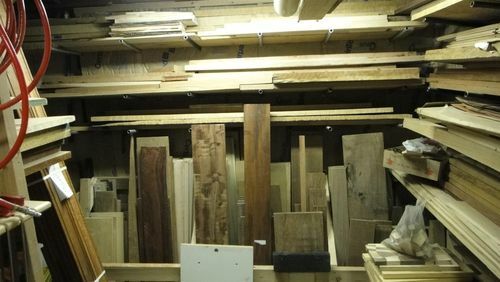 I have been lucky to find some really good buys on lumber, including a bunch of exotics, so the wood room is fairly well stocked and there is nothing better than grabbing some boards and making dust minutes later…. 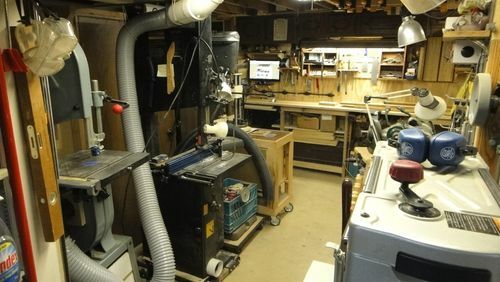 Some day I will find the right deal on a good table saw, but for now I have tweeked the Craftsman to it’s max, with the Incra LS TS positioner and custom maple router table with full dust collection. 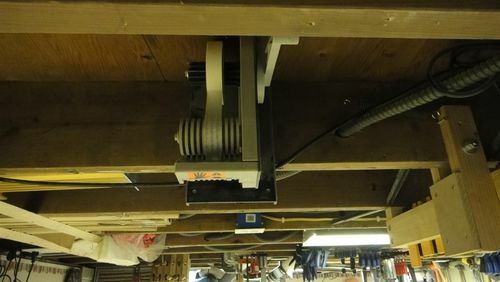 Also have a couple other Incra positioners, one that needs a table (coming soon) and the other is on a small router table that stores under the bench. Thanks for checkin it out. 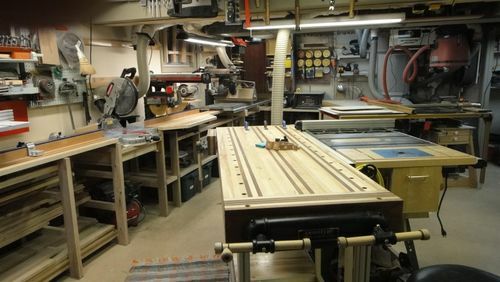 I post most of my workshop updates on my Basement blog here. Really sweet set-up and cool toys to play with…nice job. Jeff, this is certainly a nice shop that you have. 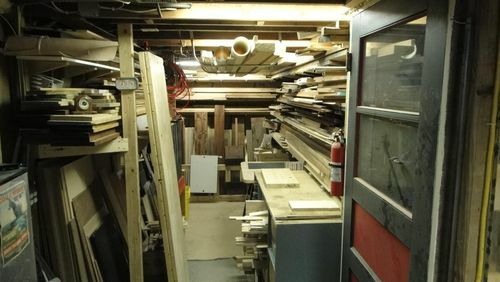 It looks to be both well organized, especially with the way you have handled your lumber and hardware, and efficient. You also have a nice set of tools to play with as well. 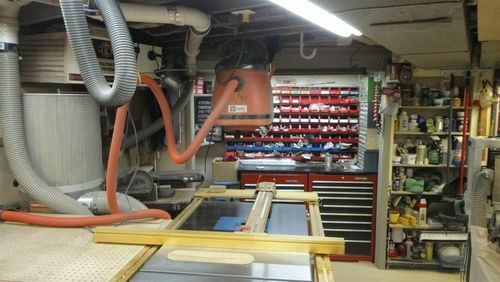 I like what you have done to your table saw. 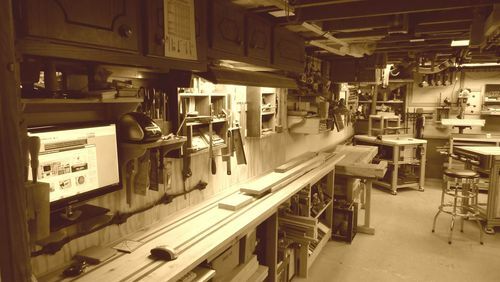 I fought with my Craftsman saw for over a decade trying to get decent cuts out of it so I can readily appreciate what you have done to yours. You have tricked yours out well and markedly improved its performance with the upgrades that you added. Thanks for the pictures. 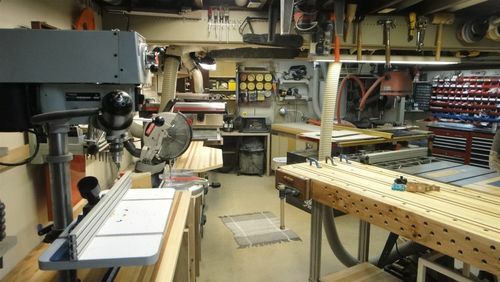 I enjoyed touring your shop. 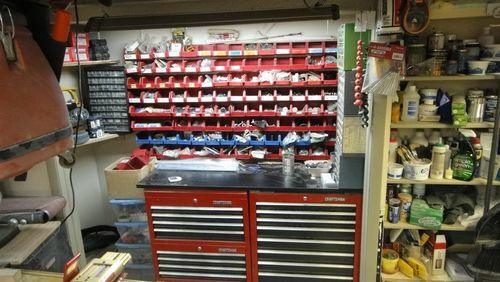 Very well organized shop with lots of tools. I like the lumber room. 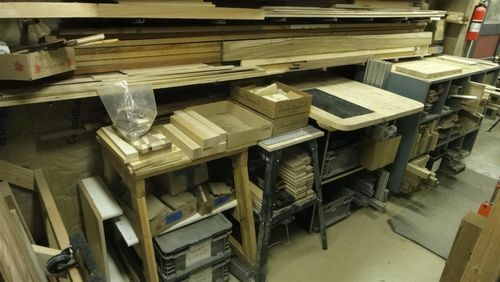 I was given a similar drafting table, and was thinking of using it for an assembly table or maybe an off feed table for the table saw. the adjustable height and tilt, it seems it should be good for something. I haven’t hauled it home yet, I don’t know it warrants the footprint in my little shop… How do you like yours? is it worth the space? The drafting table is quite handy and I use it alot but it’s also a magnet to collect junk. Someday I will build a torsion box thats dead flat, but for now I will keep this. 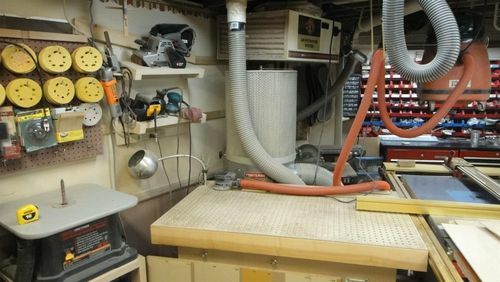 I should add, the downdraft sanding / outfeed table has really gotten alot of use, I guess maybe I didn’t mention that in the original post. Jeff, thats a nice shop. 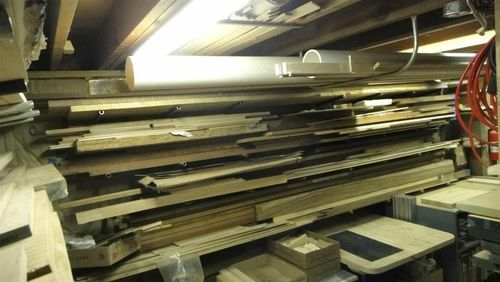 Yes I love shop pictures….Great wood pile mister!!! 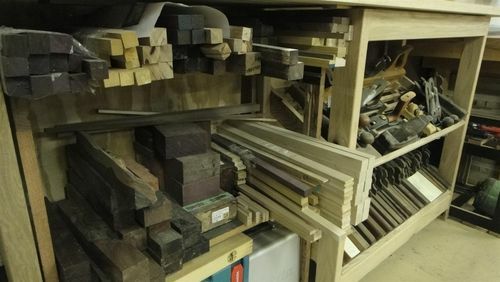 Hard to believe you have only been doing woodwork for a year and a half with all those jigs and wooden tool projects! You’ve been busy. 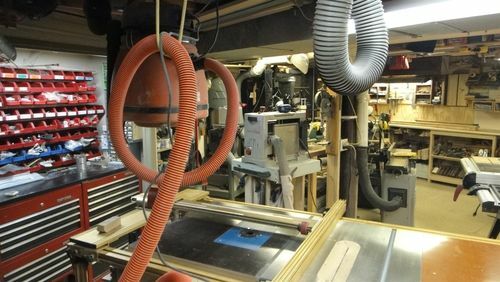 I really like the down draft table and the way you did the dust collection. A dusty attached shop usually means a dusty wife, which is never a good thing. Trust me. Oh…you already know! So…. the extra dust collection work was her idea! Good job Mrs. Jeff! dbhost, Hey, I didn’t think anybody knew about that time I dragged mortar mix in the house that poured on top of my boot after I poked a hole in the bag! What a mess! New plywood shelf works great. JL, that is really a wonderful shop that you have there. You must be very proud of it and you have a right to be. 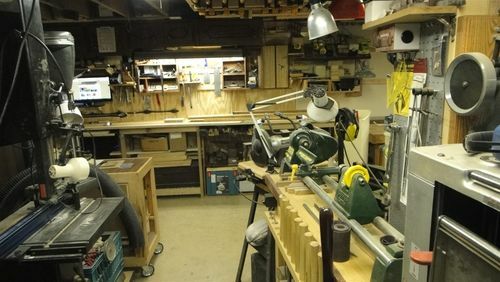 Very nice basement shop. These spaces require a lot of imaginative solutions to make the best use of what room is available, and it looks like you have been very creative indeed. 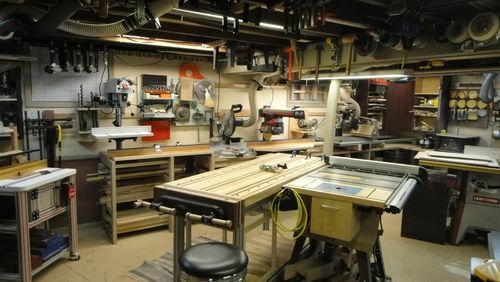 I’m working on my basement shop now; hope it turns out as well as yours. Thanks for the post.